Over the decades, the Toyota MR2 had always been the crowd favourite among enthusiasts and auto journalists worldwide. The first generation AW11 from 1984 was well-received for its nimble handling, light body, and good fuel economy. The mid-engine rear-wheel-drive coupe had a unique design, inspired by the Gundam mecha manga/anime series. At the turn of the century, the MR2 evolved into a proper grand tourer-style car. With more power, upgraded suspension, and a sleek & futuristic body, the Golden Era of the Japanese auto industry received yet another gem. The SW20 MR2 was both loved and feared by many, the latter due to it being prone to snap oversteer. Nonetheless, the car performed well in races and in real life settings, and has a strong following even till now. The third generation of the ZZW30 MR2 (called the MR-S in its native market) was the model’s swansong. Disappointingly enough, the car seemed to be a step forward, two steps back for Toyota. It was significantly less powerful than its predecessor, became a convertible, and had the visual appeal of a soap bar when parked next to the AW11 and SW20. It was close to becoming an affront to one of the most iconic Toyota models ever made. The MR2 performed as intended by Toyota. It was affordable, fun to drive around, and had a better power-to-weight ratio than the Mazda MX-5. In many aspects, it was a success. But the MR2 was not as impactful as many people were hoping for it to be, especially at the final stage of its life. Let us now look at Autoart’s take on this midship runabout two-seater sports car. Autoart released two versions of the car - the right hand drive MR-S, and the left hand drive MR2 Spyder. Both are virtually identical, except for differences in the side signal indicators, windscreen wipers’ orientation and of course, the steering wheel location. Handling the car for the first time, I was surprised by how light it was. Compared to the brick-like Kyosho Nissan that was reviewed a week ago, this model felt surreal. The model uses metal for the main shell, but plastic for the front and rear bumpers. Autoart has done an impressive job with the metallic silver paint. No visible paint differences can be seen between the plastic and metal parts. The only indicator of the use of plastic is the creaking noises it makes when handled. The model itself is quite realistic. At first glance, the lines of the MR2 Spyder have been recreated with precision. The curvature of the glass housing for the headlights are spot-on. The lenses inside are fairly realistic as well. The main grille at the bottom is not mesh, but textured solid plastic. Being an early release by Autoart, this is understandable. When opened, the bonnet reveals the front storage space, covered with an embossed “Midship Runabout” plate. Sadly, it is all a single molded plastic piece, so there is no parts to open/play around with. Autoart painted the washer fluid tank, but that is about it. Like many other older models, the MR2 Spyder received branded Bridgestone Potenza tyres. This certainly adds depth to the car. The glossy 5-spoke wheels have also been crafted realistically, with a mini black Toyota tampo at the centre. However, all of that is marred by the lacklustre brakes. The rotors are comparable to those from Maisto, and the caliper is basic and painted silver. A contrasting colour would have given the model a livelier look. Speaking of contrast in colours, I am in favour of the yellow interior. It looks refreshing, and gives the MR2 Spyder a fun, youthful look. The car rides a bit too high, though. A slight lowering would have made a big difference. The side vents are separate pieces. Though solid and lacking in mesh, they are decorated with a dimple pattern. The interior door panels are quite detailed, with different colours applied to differentiate the various parts, such as the handles and arm rests. There upper panel, where the handle is located at, is fabric and colour-coded with the seats. It is a neat detail that is definitely appreciated, especially on a convertible. The door hinges are definitely more subtle (and thus, more realistic) than dogleg ones, but do not open as smoothly as they should. They pale in comparison with those found in Kyosho or Hot Wheels Elite. The interior itself is decent in detail. Without the yellow trim, it would have been a lot more sombre, with the dark grey/ black dashboard and panels. Like most Autoart cars, the MR2's interior is fully carpeted. The seats are a unique blend plastic and a rough sandpaper-like material to mimic fabric. I am not a fan of how it feels to the touch, however, preferring actual fabric. The seatbelts, on the other hand, are fabric, with metal for buckles. All pedals are painted silver with black accents, including the foot rest. The steering wheel looks quite good, even if it is far from the most exciting-looking one out there. Even though the centre console is relatively simple and straight-forward in design, Autoart recreated it with amazing detail. Every single bit of it, from the AC knobs to the sound system, has been crafted and painted with accuracy. In a lesser model, they would have been replaced by stickers. Even the static sun visor and soft top look functional. Opening the engine cover, the MR2 Spyder’s 1.8 litre 4-cylinder engine can only be partially seen. Like the real car, the 1ZZ-FED motor is tucked quite deep inside the engine bay. It is highly detailed and a full block, and not a sorry-looking plastic engine plate that plague most model cars today. If you look hard enough, you can see cables, wirings, a battery and other bits inside. There is even a realistic X-strut brace towering over it. The engine cover is operated via dogleg hinges, and has two engine vents. However, they are not perforated. Like the rest of the car, the tail lights look decent in person. No studs or pegs are visible, and the curves of the housing are flush with the rest of the body. The small grille between them is not perforated, but textured plastic. On the other hand, the main large one at the bottom is, and you can see through it. The matte silver single exhaust pipe is not immediately visible. I am thankul for that, as it looks cheap and does not go well with the MR2 at all. There is not much to say about the undercarriage of the car. Sure, there are cables and pipes running throughout, and some form of suspension detail present. They just not worth noting due to the overwhelming dullness. 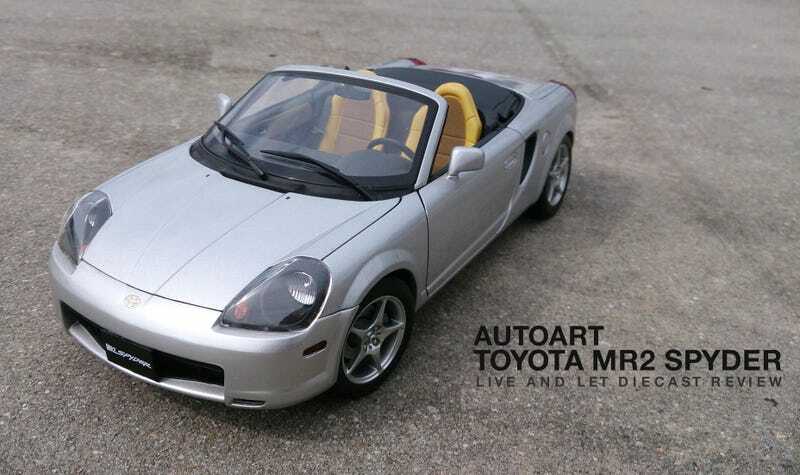 The Autoart Toyota MR2 Spyder is a well-made car. It has good detail, fairly small and light (though some collectors including myself would prefer something more substantial), and has both RHD and LHD options. Some of the details shown were not even present in mainstream models of the same era. If you own the actual car, this would be a wise purchase as it is a decent scaled version of it. Plus, being an old and out-of-production model, it is insanely cheap today. The modding community would have a lot of fun with this, for the same reasons. I would not recommend it to general collectors, however, as it is simply too forgettable.